LONDON: When it comes to the 4×400-meter Olympic relay, the American men aren’t used to being overtaken at the end, the way Angelo Taylor was Friday night, reported Associated Press. Then again, they have never really run that race under these circumstances. The day after Manteo Mitchell finished out his preliminary lap on a broken leg, the banged-up U.S. team made sure he would get something as a reward. But it was a silver medal, not gold. Taylor got passed by Ramon Miller of the Bahamas on the final lap — marking the first Olympic men’s gold medal in any sport for that island country and the first American loss in that race at the Olympics since 1972. Instead of complaining about the color of their medal, the Americans celebrated their teammate’s courage. The Bahamas won in 2 minutes, 56.72 seconds, .33 ahead of the U.S. Trinidad and Tobago finished third and the South African team, anchored by double amputee “Blade Runner” Oscar Pistorius, fell behind well before Pistorius received the baton and finished last. Mitchell’s selfless run kept the United States in the mix for a medal. In the preliminaries Thursday, he felt a pop in his leg at the halfway point of his lap but stayed on the track to move the baton along to teammate Joshua Mance. The U.S. qualified easily. Doctors later told him he had a broken left fibula that will take up to six weeks to heal. Mitchell came to the stadium for the race Friday using crutches and wearing a gray walking boot that covered his foot and leg up to the knee. He was part of the celebration after Taylor crossed the line. Mitchell joined the last two Olympic 400-meter champions, Jeremy Wariner and Lashawn Merritt, on the sideline with injuries. That juggled the lineup and left Taylor, a 33-year-old with two Olympic golds in hurdles, to run the anchor leg. He couldn’t hold off Miller, who closed out the race with a lap of 44.1 seconds to make history in the Bahamas. Not quite as tough with Taylor running the anchor lap. 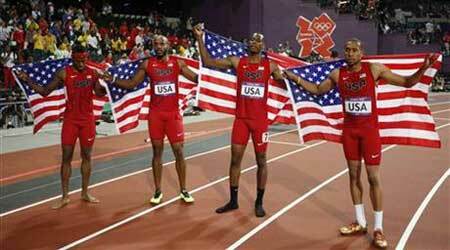 He was handed a 10-meter lead when he received the baton, but Miller chipped away. By the final stretch, Miller had passed him and the rest of the race was academic. The Americans had won gold the previous eight times they had competed, missing out only at the boycotted 1980 Moscow Games. Taylor, running in his fourth Olympics, adds silver to his three golds: 400-meter hurdles in 2000 and 2008, and the 4×400 relay in 2008.